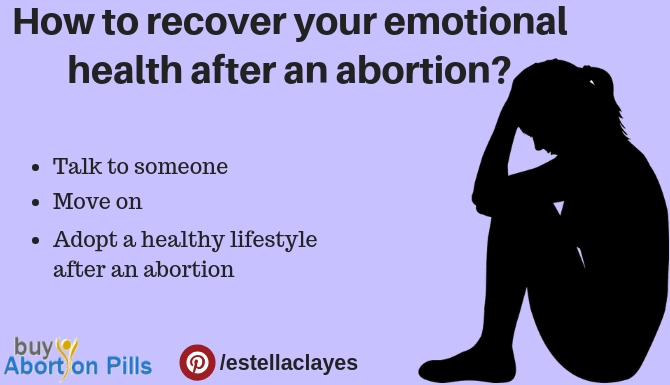 How to recover your emotional health after an abortion? An unwanted pregnancy can be a disaster in a woman’s life, especially in lack of financial, social and emotional support. There is an option of an abortion, either surgical or medical. A medical abortion is one of the secure ways of doing an abortion. It is done using abortion pills and MTP kits, which are easily available at any online pharmacy or even local drugstore. A research says that about 10% of woman health issues are associated with an abortion and unwanted pregnancy. Of course, abortion induces the feeling of relief in the case of an unwanted pregnancy, but there are other feelings too. These feelings may vary in different scenarios to different women. They are mostly dependent on the conditions in which they had to take the decision of an abortion. Most of the times the emotions they feel are mixed- both negative and positive. Positive emotions mostly include relief from an unwanted pregnancy whereas there are many negative feelings. How to recover your emotional strength after an abortion? Remember, you have the right to make decisions about the life growing inside you. It is a phase and will be gone. Be brave and face the situation, think all the possible choices before you and choose one wisely. If you feel overwhelmed and extremely stressed please do not hesitate to ask for help. You can always talk to your partner, family members or even a close friend. Also, there are lots of web portals which provide support to women after abortion. Read the experiences of other women who went through it. It will be helpful. Remember, you made a decision which was right for you at that time. It is okay to have regrets but see it as a part of life. Make a list of the things you are looking forward to doing. If you feel that the negative feelings are hard to handle, please seek urgent help such as counseling. There’s a saying, “A healthy body leads to a healthy mind”. Have nutritious and healthy mealtime to time. Do exercise regularly. Try to reduce stress using different relaxation techniques like doing meditation and yoga. The pressure of being in dilemma- that is if the decision taken is right or wrong could cause anxiety to women. Also, the financial, emotional and social pressures induce severe anxiety. Lack of support from family, friends or partner causes sadness. Sometimes women are forced to do an abortion when they are not willing to do so. It causes grief. Teenage pregnancy is considered a stigma to a woman’s character. Also being sexually active at a young age is said to be inappropriate in some regions due to social, spiritual and religious beliefs. Women are continually criticized by a society which induces a feeling of humiliation. Guilt is a common feeling experienced after an abortion. Women may consider themselves guilty for some reasons, such as, for choosing an abortion, for putting themselves in such a situation. Not being able to choose an appropriate option for herself, either due to social pressure or financial dependency, a woman may suffer regret. Lack of emotional support from family, friends, and partner can cause the feeling of extreme loneliness in women. It might get difficult to share everything that’s going on your mind after an abortion or to get someone to listen to everything patiently and attentively. A feeling of loss might occur due to conditions which forced one to take the decision of abortion unwillingly, or the things which happened at the same time, such as, breakup, no support from family, social backlash. An outburst of all the above feelings and the inability to handle them can lead to depression. This entry was posted in women's health on November 16, 2018 by adbuyabpsnet.